Timeless luxury by Maurice Lacroix. Timeless sophistication deserves a timeless luxury timepiece. That’s why we co-developed a unique K900-specific analogue dial in partnership with luxury timepiece designer Maurice Lacroix as a symbol of globally renowned sophistication and the pursuit of perfection in craftsmanship. The K900’s passive systems consisting of advanced seat belt, airbag and child-safety features are designed to help give you added peace of mind on the road. With UVO luxe, K900 owners enjoy all the standard UVO essentials like Maintenance, My POIs, My Car Zone Alerts, and Trip Info, plus the added convenience of Remote Climate Control that includes heated/ventilated seat settings and driver preferences, and Remote Engine Start/Stop. 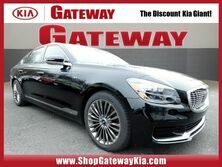 K900 owners also receive membership to the Prestige Club, Kia’s exclusive call center for premium clients. Now everyone can stay charged and connected no matter where they’re sitting. The K900 boasts both standard front and available rear wireless smartphone charging, along with all the connectivity features of both Apple CarPlay™ and Android Auto™.